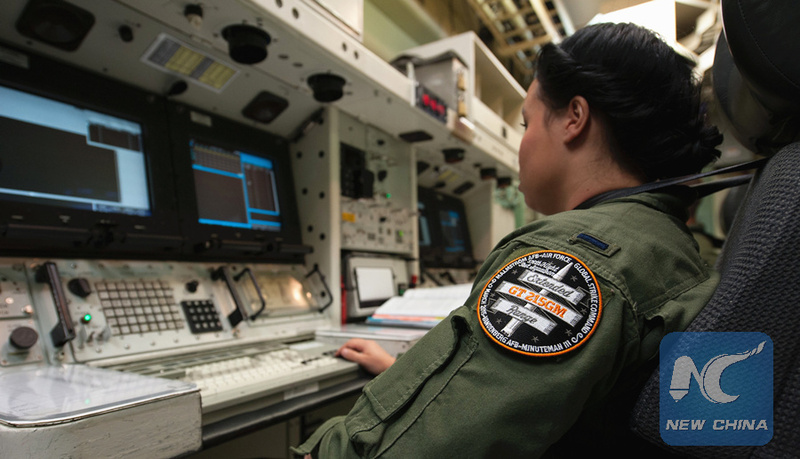 In preparation for an unarmed Minuteman III intercontinental ballistic missile launch, a missile combat crew commander practices procedures at Vandenberg Air Force Base, California, U.S., March 19, 2015. MOSCOW, Nov. 8 (Xinhua) -- The U.S. strategy of a limited use of nuclear weapons could cause a global catastrophe and does not guarantee victory in a possible war, the Russian Foreign Ministry said Thursday. "Voices sound louder and louder in the United States, calling for enhancing the role of nuclear weapons and expanding the capabilities of the U.S. nuclear arsenal," Maria Zakharova, spokesperson of Russian Foreign Ministry, said at a news briefing. "The need for such a policy is invariably presented through the prism of a certain mythical Russian threat," she added. Zakharova referred to an article by former U.S. Deputy Assistant Defense Secretary Elbridge Colby in Foreign Affairs magazine, in which he urged the United States to increase its nuclear potential and prepare for limited, effective nuclear operations. Washington has already announced plans to build nuclear warheads and their delivery systems, with some experts claiming the United States and its allies would be able to win a limited nuclear war, Zakharova said. Russia considers such a policy irresponsible and extremely dangerous as Moscow firmly believes that there can be no winners in a nuclear war, she said. To think about a limited nuclear war "is tantamount to playing with the devil," Zakharova said.